TROUBLESHOOTING TIP: If the app crashes on start, or the widgets don't show up, restarting your device usually fixes it. - "Stats List" Widget - Fully editable shortcut list of your apps in text form, you can also edit the name displayed. - "Stats Boxed" Widget - Editable boxes with missed calls, unread texts and battery percentage. *Note: You need a launcher like Nova Launcher(Dev recommended) or an app like unicon to apply the theme. Most of the launchers above offer free versions. - All pip-boy wallpapers shown are included. Full Version includes blue and amber icons and wallpapers. - XXXHDPI high definition modern, green fallout pip-boy 3000 icons included for super large HD screens. All Icons are 192x192. - Some parts of the green fallout pip-boy 3000 icons are transparent letting each show the provided scenic/landscape backgrounds or to your own backgrounds. - Contains over 3,200 different clean, flat and simple fallout pip-boy themed icons with many variations of default lined icons such as phone, contacts, camera, etc. - Wallpaper chooser comes installed to replicate a pip-boy on your device..
- Easy link to request more outline icons. - Clean, green pip-boy 3000 icons work best with dark wallpapers. This app requests permission to view phone and messages. These are only used to display the number of missed calls and texts. The app does not collect any private data. This is an unofficial theme and is not affiliated with Fallout, or the Fallout Pip-boy 3000. Fixed sunrise/sunset times on weather widget. 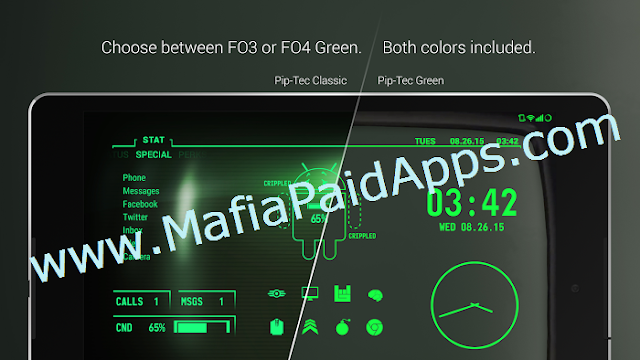 Added FO3 Green as a separate app; "Pip-Tec Classic" Install it from the side menu!